Japanese sporting equipment manufacturer ASICS has been making waves in the rugby world in recent months. After a few years of being on the fringes of the rugby shirt world, supplying a few clubs here and there, but hardly a major player. All that changed in 2013, when ASICS signed up two of the biggest brands in world rugby Australia and South Africa – a real statement of intent that puts the brand, along with BLK, as a new major player in the rugby shirt world. This Wallabies home jersey then, is the first salvo in ASICS’ attempt to firmly establish themselves alongside the likes of Canterbury, Adidas, Under Armour and BLK as a big player in the international rugby world, ahead of the 2019 Rugby World Cup, which will be held in the brand’s home country of Japan, and it’s fair to say, they’ve done a pretty bloody decent job. We’re always wary of new brands coming onto the rugby shirt scene, as often the designers try to make an impact and announce their arrival by creating something that’s eye-gougingly hideous – and given the shirts that ASICS have produced for Castres this season, we were a little bit concerned they’d follow suit. 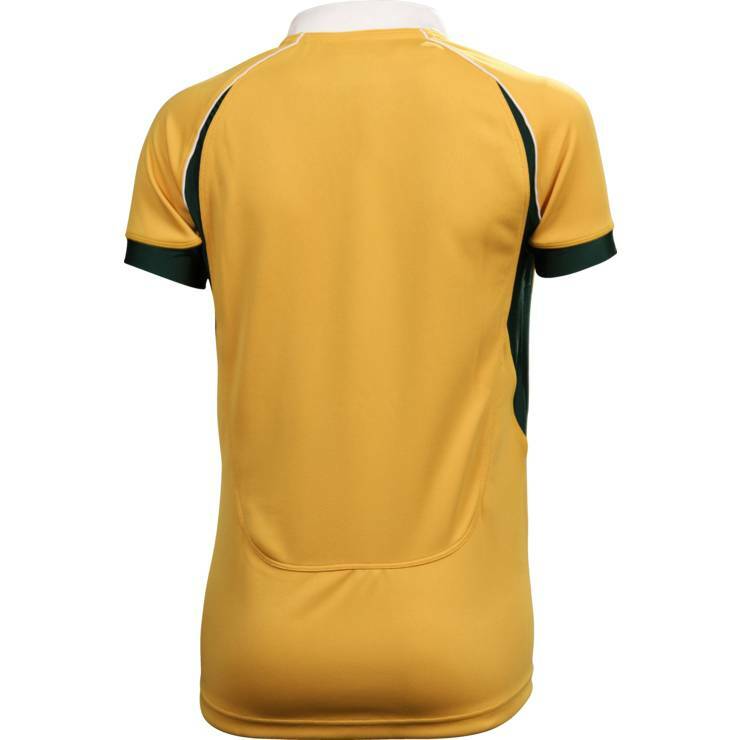 We needn’t have worried – this is about as classic and tasteful an Australia shirt as you could ever hope to see. To the point where it’s almost willfully inoffensive. It’s like the rugby shirt equivalent of UK MOR stalwarts Elbow – even if you don’t really love what’s going on there, you can’t really bring yourself to say anything negative about it… it’s just… nice. If that sounds disingenuous then we apologise, because this is a very handsome, very classic-looking shirt – ASICS have really done a nice job of capturing the essence of an Australia shirt by bringing in a lot of classic elements to create something that really looks lovely. For starters, we really like the fact that white has been brought back into the shirt. For the last few years of KooGa/BLK sponsorship, the designers abandoned white for a straight green ‘n’ gold look – we liked that a lot, but white, particularly in the collar has been part of the Aussie jersey for some time, and it’s good to see it make a return here. The collar itself, while not being a proper, old school collar, is still a nice touch, and elevates the shirt from the dreaded spectre of t-shirt-dom. 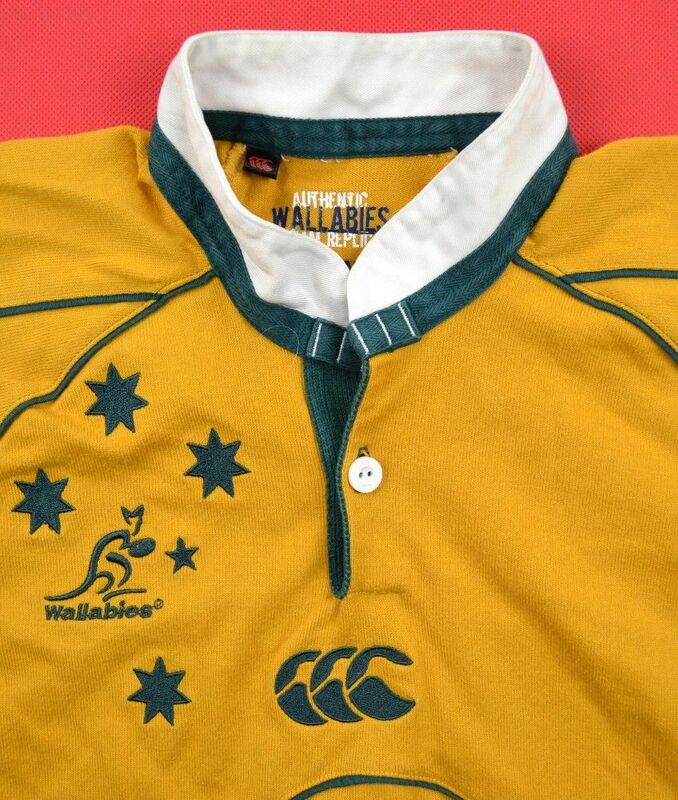 In fact, it really reminds us of the collar on the 2007 Australia jumper from Canterbury, which seems to have provided quite a few design cues for the new shirt (the green swatch below the front of the collar for example), but you have to say, the ASICS shirt is a vastly cleaner and more appealing affair. Another thing the new shirt brings to the fore – stars. 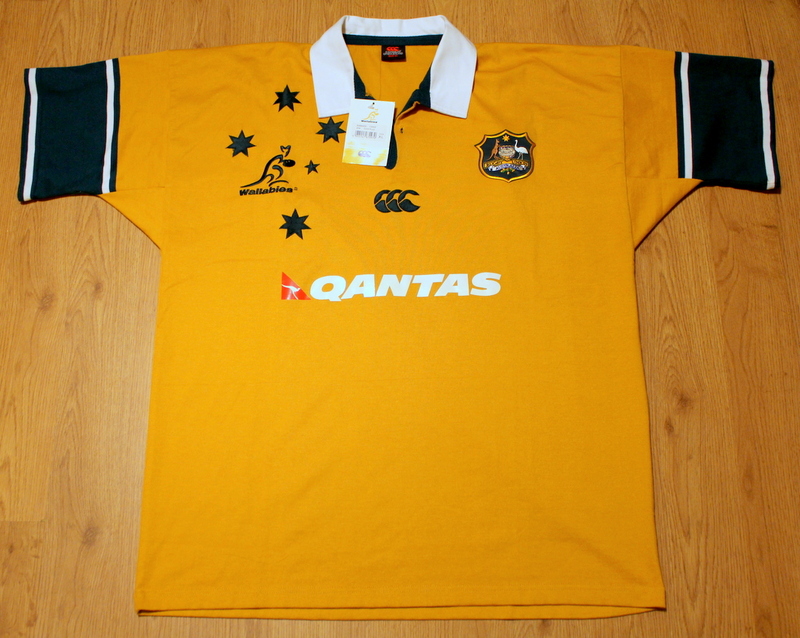 The stars of the Southern Cross constellation, borrowed of course, from the Aussie flag, have been a fixture on Wallaby jerseys for many a year, but designers generally tried to shoe-horn the damn things around the Wallaby badge on the right breast, and it just looked a cluttered mess. When KooGa took over, they abandoned this, moving the Southern Cross to the front of the jersey and subtly sublimating it into the material. On the field however, it wasn’t always the most noticeable design motif, so it makes sense that the ASICS have opted to change it to the more traditional green, while keeping the vastly superior positioning from the KooGa/BLK design. The one thing we’re not quite convinced by, however, is something rather fundamental, and that’s the colour of the shirt. 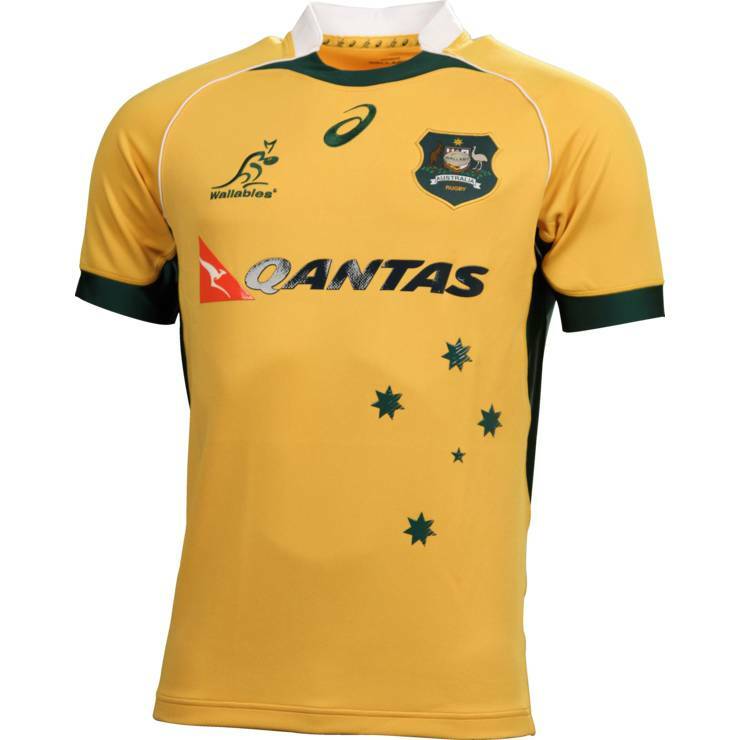 In recent years, BLK/KooGa have moved the overall colour of the Wallaby jersey to a more yellowy shade of gold, and while we’re sure plenty of traditionalists didn’t appreciate that, what ASICS has done here isn’t much better. 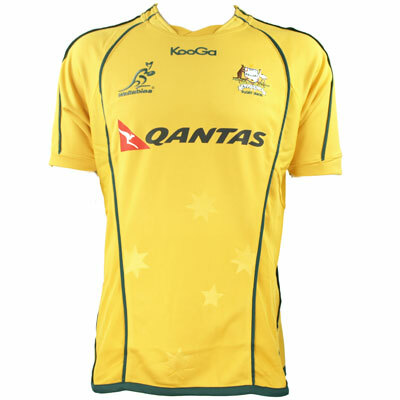 It’s always hard to say for sure until you have it in your hands, but the shade of gold here looks almost washed out – certainly in comparison to last year’s shirt, but when compared with the gold of classic Australia shirts, too – it doesn’t have the deepness of traditional Wallaby gold. That said, we’re judging the colour based on a photo, and lighting can do weird things with colours, so let’s put the pitchforks away for now and take this shirt on its merits. This is a positive first step into the world of international rugby for ASICS – the Japanese brand’s designers have clearly done their homework and tried to create a jersey that’s classic and tasteful. And while it’s a little bland, we’d rather that than some over-complex monstrosity – it shows that ASICS respects the traditions of rugby shirts, and that’s always a good sign. We’re really excited to see what this new big player does next. Asics always prefere lights yellow instead of gold. Design is good but yellow colour is awful. It should be gold not light yellow. Now a days Aussies are more stick with asics products. Its sad that asics are trying to replace Australian traditional gold colour with light yellow. First they did it with cricket and hockey team now its with rugby team. Nobody in Australia are noticed that their traditional colour gold is washed out by a poor Japanese brand.